At least 17 people have died and four more are missing after violent storms hit south-eastern France, officials say. Three elderly people drowned when their retirement home near the city of Antibes was flooded. 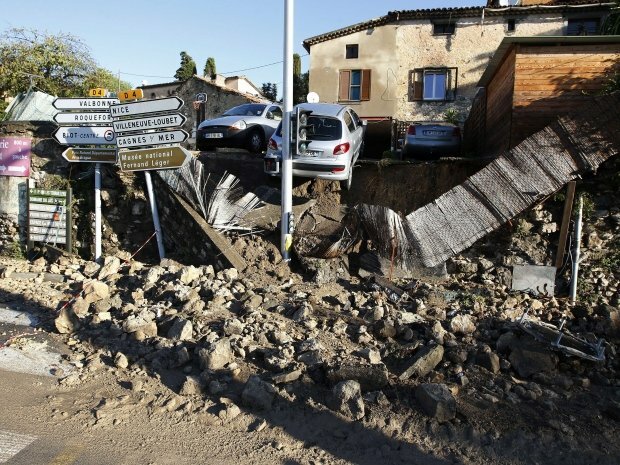 President Francois Hollande announced a state of “natural disaster” in the affected region. He thanked rescuers and expressed the “solidarity of the nation”. Heavy rain hit the French Riviera on October 3. The main highway through the area has been closed, trains halted and hundreds of tourists sought shelter at Nice airport overnight. About 10,000 homes were still without power on October 4, mainly in Cannes. Some concertgoers attending a show by rock legend Johnny Hallyday at a venue in Nice had to sleep overnight there after becoming stranded.